This Curvaceous High Foam Shampoo from Redken is created to refine smooth, separated curls, leaving the hair deeply cleansed and silky in texture. Proven to reduce frizziness by 97%, this innovative formula contains natural oils that work to tame the hair and give you more defined curls, without making your hair feel heavy. This is the best shampoo that I have found for my Brazilian treated hair... it lathers and foam brilliantly and leaves my hair feeling clean - unlike may other sulfate free shampoo's. I also love the Blonde sulfate free shampoo, but found that it made my highlights too blonde (if there is such a thing). Would whole heartedly recommend both sulfate free shampoo products. My hair is not strong and constant bleaching and dying the last year have made it almost impossible to make it smooth and shiny, and to keep the curls well-shaped and bouncy. For the first six months I used a shampoo for damaged and coloured hair, but it didnt do much in the way of bringing back my curls. When my hairdresser recommended Redken Curvaceous Cream Shampoo 300ml I thought it wouldnt be repairing and moisturising enough. She insisted and Im so glad that I followed her advice! Just after shampooing my hair is soft and the curls are beginning to take shape. It combines moistening and curl care well, and makes the hair clean without stripping it of colour. Its one of the best products for my hair that I have tried! As for the smell, I actually like it. 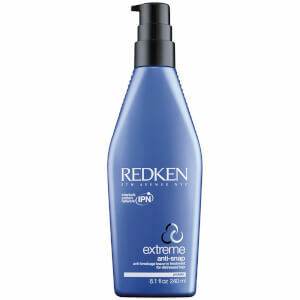 Redken Curvaceous Cream Shampoo 300ml doesn't deliver what it promises. It's very thick and it hardly forms any leather. I couldn't get a feeling of clean hair, even after 3 repetitive washes. When your hair dries, it's flat, weighed-down and lifeless. Huge disappointment.